Gertudis, easily one of the more strangely named packages that have passed through our labs, is also one of the most impressive. This instant art-look tool throws users into the shallow end of art-making by offering a collection of preset looks and brush effects that can be applied to any image with a few mouse strokes. Load your source, move the mouse over the resultant window (as it's called), and Getrudis fills it with simulated brush strokes. Unlike some art-look tools that are available, Gertrudis uses intelligent edge detection to follow contours, and this makes the results much more convincing than the slap-it-all-over results that are produced by some of the competition. You can control the size, density and texture of the strokes, and also apply pattern effects to create more sophisticated final productions. 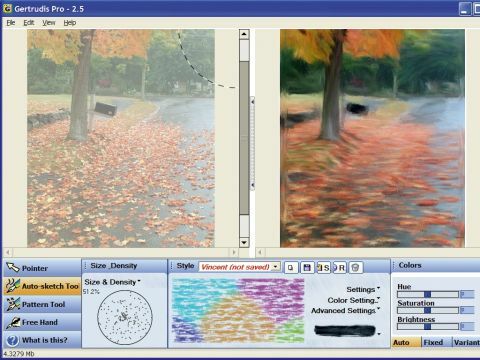 The software also includes a library of preset looks and styles to choose from including standards like oils and watercolours and oddly monikered alternatives like zas and oepengl. Even when it's used in the least sophisticated way, the quality of the output is almost disconcertingly good - you'll see worse painting in many amateur Sunday Painter exhibitions. But as your art work gets more sophisticated you can start combining brush sizes and textures for even better artistic results. There's a certain irony in having to practise with an instant art tool to get the best from it. But at its best Gertrudis can be very good indeed. Any problems? Not many. The most obvious issue with the tool is that quirks in the edge-detection algorithm reads the edge of the image as an edge in the photo and paints it accordingly. You have to trim the output or expand the size of the image before running it through Gertrudis to compensate for this effect.